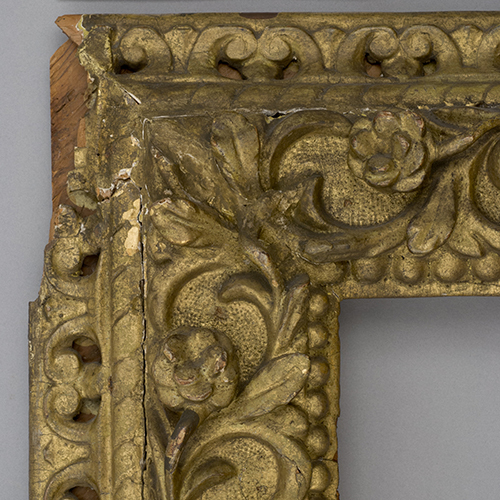 Harvard Art | Frame Survey and Treatments for "the Davis. Rediscovered"
Frame Survey and Treatments for "the Davis. 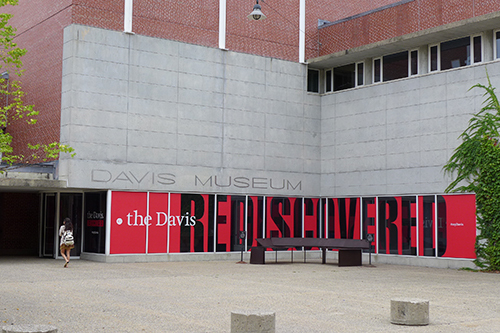 Rediscovered"
On September 28, 2016, the Davis Museum at Wellesley College opened the Davis. Rediscovered, a major re-installation of their permanent collection that more than doubled the works of art on view. To prepare for this ambitious project, the Davis Museum began working with Harvard Art on assessment and treatment of frames as early as 2014. In the summer of 2014, Susan Jackson conducted a survey of 51 frames in the Davis’s collection, ranging in time period from 15th-century European through 20th-century modern American. Over six days, she examined and documented each frame, then prioritized their treatment needs—those requiring immediate stabilization, or major treatment to those needing minor touch-ups. With this thorough survey in hand, the curators were able to make informed decisions about how to proceed with preparing the art for exhibition. 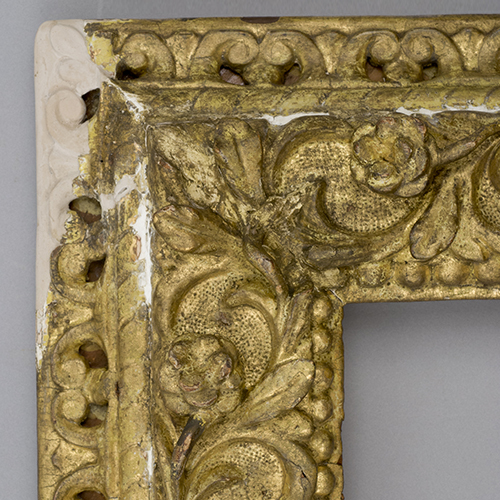 Allison Jackson, Susan’s daughter and fellow conservator at Harvard Art, treated many of the frames on-site at the Davis Museum. 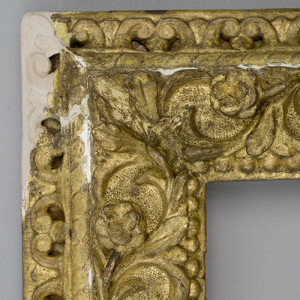 Four frames that required more in depth treatment were sent to the Harvard Art studio. Thorough Treatment Proposals including condition reports and options for different levels of treatment were developed for each frame. A treatment plan was worked out with the curators which best suited the frame and the museum’s needs. 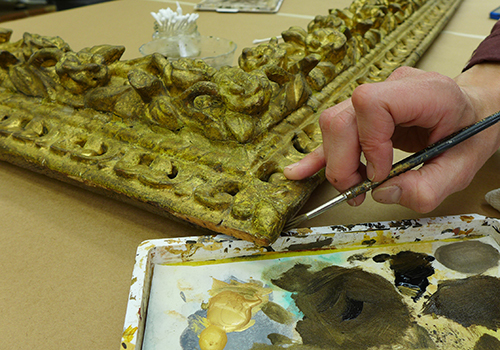 Among the treatments performed by the Harvard Art conservators were cleaning and surface and structural stabilization. 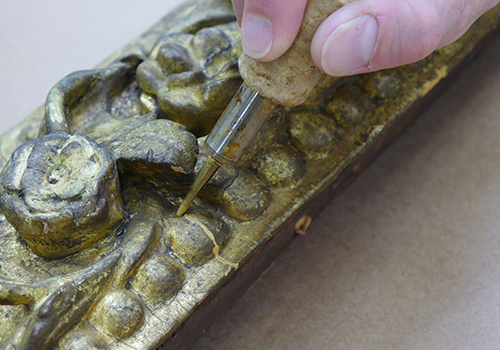 They replaced damaged or lost ornament, filled losses, uncovered original gilding hidden by previous restorations, and ingilded and inpainted areas of repair. 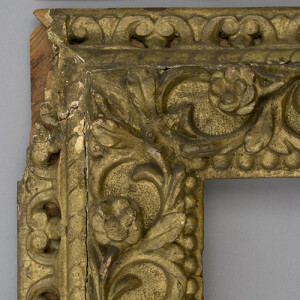 The goal of their frame treatments is to maintain as much original material as possible and bring out the most in a frame given its current condition. 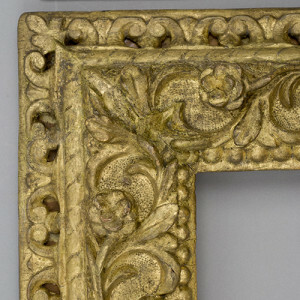 Detail of frame for Bernardo Strozzi’s St. Francis in Ecstasy. 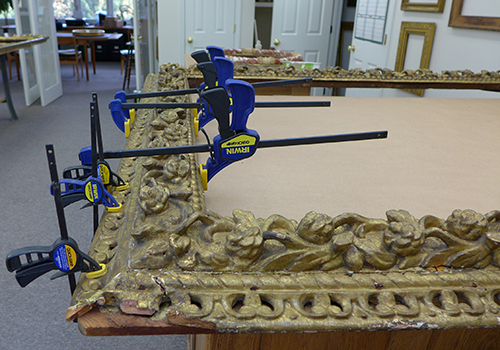 Structural work on the Bernardo Strozzi frame in the Harvard Art studio. Detail of a crack being filled with wax. This was later inpainted to match the original gilding. Inpainting areas where ornament was repaired.